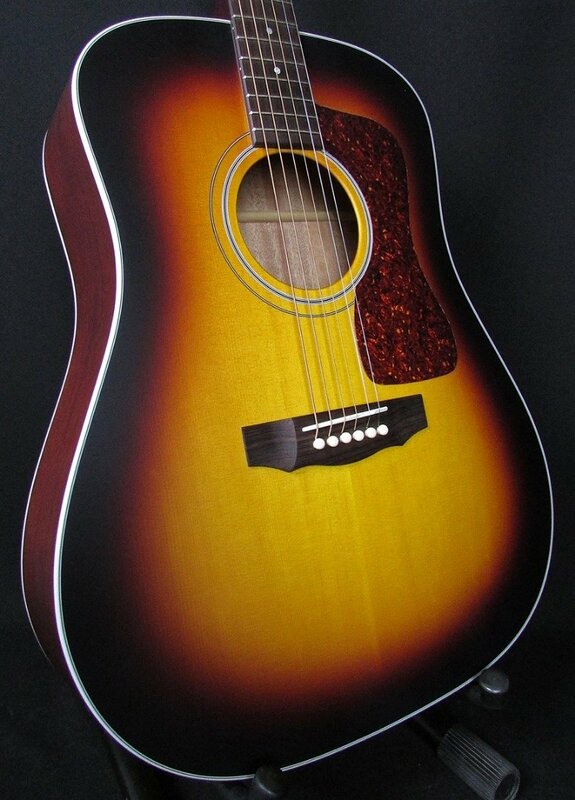 Brand new Guild D 40-E in Antique Sunburst wGuild hard shell case. Brand new to the Guild USA line, the D-40 is perfect for players looking for that ultimate dreadnought sound. The classic wood combination of a solid Sitka spruce top and solid African mahogany back and sides provides remarkable volume, clarity and sustain. The D-40 features an East Indian rosewood bridge and fingerboard, premium 20:1 open-gear tuners, and a hand-cut bone nut and saddle. An elegant and thin satin varnish finish gives this guitar its familiar broken-in look and feel, while allowing the tone woods to reach their optimal sonic potential. The D-40s timeless appointments include a vintage style rosette, tortoiseshell pickguard, white ABS binding,and Guilds peak logo inlaid on the headstock. Each D-40 comes with a hand-signed, numbered certificate of authenticity, and ships with a Guild archtop wood case with a built-in Humicase humidification system. A discreet, USA-made LR Baggs Element VTC pickup is installed, and sounds great!